For me, the question that this book raises, but does not answer, is whether the fear of losing someone you love is worse than actually losing them. This haunting fear runs through all of the main characters in this compelling book as they lose relatives, security, belonging and friendship, constantly having to start again and rebuild their lives. The book begins with Dominic Baciagalupo and his twelve-year-old son, Danny, living in a logging camp on Twisted River where Dominic is the camp cook. We learn early on that Danny’s mother died at the camp and much of this early section is told from the perspective of young Daniel who is on the brink of understanding the adult world and desperate to find out what happened to her and to understand the relationships around him. Through this we also meet Ketchum, Dominic’s great friend who acts as another (slightly terrifying) father to young Dan. In an accident that would be funny if it weren’t also awful, young Danny mistakes the local Constable’s girlfriend for a bear and kills her (this is on the back of the book, not a spoiler!). This results in Danny and Dominic making a moonlight flit out of the camp and spending the rest of their lives on the run from the ‘cowboy’ constable. Much of the book is about the interplay between love and fear; how it is impossible to love someone without simultaneously being terrified of losing them. As the plot of the book is driven by the very real fear that the cowboy constable will catch up with them and actually kill them, this fear becomes all-encompassing at times. It means that the other deaths are more unexpected when they come. But as well as fearing the loss that comes by death, the book also seems Danny and Dominic repeatedly uprooting their happy lives to flee the cowboy. Their sense of lost opportunities, family and lovers gives the book a real poignancy. The heart of the book though are the complicated relationships between Danny, Dominic and Ketchum. Irving has a real talent for building vivid characters with strong, compelling voices. Ketchum is a great character – a real, brash bear of a man with a murky past, his fierce, eccentric protectiveness of Danny and Dominic makes him feel at times like a backwoods, bear-killing guardian angel. Dominic, on the other hand, is characterised by his quiet sincerity and love of good food and his son. It is awful for such a man to have to be constantly on the run, looking out for the cowboy behind him. And Danny, well, we see Danny grow up through the book before it finishes when he is about 60 – I’ll leave you to make up your own mind about him. The book is also a lot about the process of writing (Danny grows up to be a novelist) and I loved the way Irving used that to link the end of the book back to the beginning. I also loved the way Irving used different points of view to move backwards and forwards along the timeline of the story, both to build suspense, and to help you feel like you were getting to know the characters like you do normal people – in a seemingly haphazard way. The book was really well paced, a good bit of suspense, some funny moments to lighten the tension and just really vivid, evocative writing that completely drew me into the stories and landscapes of the book. I thoroughly recommend it. 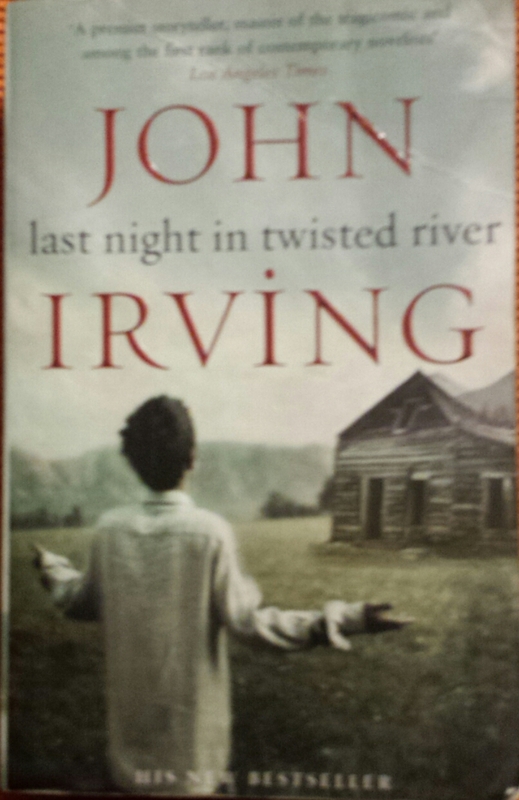 Tags: America, book, book review, books, Canada, John Irving, Twisted River, Writing. Bookmark the permalink.